This is one of those rare books where the attention to detail is so precise and the worldbuilding so well done that the words wrap around you and pull you in. 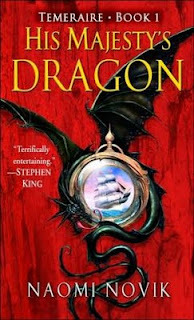 The protagonist, Laurence, lives in an alternate history where dragons are used for combat during the Napoleonic Wars. I love when history meets fantasy. 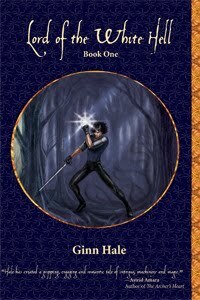 This series has a very fresh and appealing tone, one of honor and chivalry that rings with affectionate nostalgia. The sense of manners and decorum lends a lighter, upbeat air to the narrative. Even when tragedy or betrayal invades the plot, concepts such as duty and loyalty make a complicated world a little simpler. From start to finish, Laurence remains a likable character. A navy man, he lives by strict morals and ethics, a combination of military imposed rules and his own sense of right and wrong. He follows a clear decorum and respects tradition, though he always tries to do right by the people (and dragons) around him. Of course, this personality type causes some tension when Laurence must give up his navy career for a different path, one in which everyone functions by entirely different, more informal, social guidelines that Laurence struggles to understand and adopt after years of careful courtesy. Laurence's relationship with the dragon Temeraire echoes with the tenderness of a couple. Though not a romantic match, loyalty and increasing ardor binds these two together. Their constant, mutual consideration for the other adds to their individual charm. Temeraire's straightforward and engaged attitude, not to mention his natural intelligence, are amusing on a dragon, and he's full of additional surprises and oddities. One often wonders why he works within human systems with so little complaint and no effort to escape for freedom and independence, but the answer is clear: he values Laurence's friendship (if that word is strong enough) above all else. Despite the looming theme of war, HIS MAJESTY'S DRAGON presents an uplifting snapshot of humanity. Laurence's devotion to Temeraire specifically and all dragons by extension inspires faith in our better qualities, such as love and devotion. I cannot predict whether the series will head towards a darker outlook, but I finished the first book with the comforting sense that admirable values will persevere, despite cruel odds. Wow! Though I read many great books, I haven't been this hooked by one for a while. I tend to stay up reading until midnight when I make myself go to sleep. Didn't work with LORD OF THE WHITE HELL! When I finished at one am, I could barely fall asleep as I wondered if there was any possible way to get the second part in the middle of the night. I resolved to buy book two first thing in the morning, only to find the bookstore sold the last copy the day before! Now I have to wait three more days to continue Kiram's story while I try to resist hunting down the customer who bought that last copy and mugging him for a book. Kiram is the first Haldiim to attend the Cadeleonian Academy Sagrada. Though Cadeleonians often strike him as narrow-minded, he doesn't intend to turn his nose up at this opportunity. The school rooms him with a Cadeleonian student named Javier, who is feared by everyone else because of the rumors that a white hell he can’t always control curses him. Coming from a less suspicious background, Kiram isn't bothered by his roommate’s silly hell. However, his instant and only strengthening attraction to Javier does concern him, because Cadeleonian religion, unlike Haldiim culture, forbids such unions. Hale writes really well, always more than a good start. Her carefully crafted world provides us with the right amount of detail when needed without overloading the plot with unnecessary facts. This meticulous writing made it easy to imagine the setting and probably contributed to how naturally I related to Kiram. Not only could I always picture his location, actions, and company, but more importantly I felt whatever Kiram felt. The romance in LORD OF THE WHITE HELL hits that perfect balance between hot and steamy, and tender and affectionate. Earlier this year, I critiqued a book starring a lesbian couple for being too fixated on the fact that two women comprised the couple. If you read that and hoped for an example of a book that I think does more credit to gay couples, LORD OF THE WHITE HELL would be it. This book doesn't have any of that discouraging sense of "Gasp! Look - he's gay." Simply put, it’s an incredibly romantic story. I enjoyed the book throughout, but the last few chapters riveted me. The intense, climatic ending is heartbreaking in a physically sickening way. I felt Kiram's pain, hurt, and disgust as though the emotions were my own, and part of why I need the next book so desperately is because I want him to find that happy ending he deserves. Despite being fantasy, the most depressing points of the book are so emotionally impacting, because they feel so real. If you strip the fantasy elements away, what's left are raw, agonizing problems that people in our world struggle through. I honestly cannot tell whether Hale will reward her readers after some misery or if Kiram will have to work past this particular hurt and look to the future. Either way, I've found a new series to add to my favorites list. "The first thing you find out when yer dog learns to talk is that dogs don't got nothing much to say." And so begins the first book in the CHAOS WALKING trilogy, setting up a humorous tone of annoyance and unexpected insight. Savor this laugh at the beginning, because you might be crying by the end. In Todd's world, you can hear everything anyone thinks in the form of "noise." This means a constant, overwhelming bombardment of words, fragments, and full sentences, not to mention images. Ness takes into account the politics of such a world and even when all thoughts can be heard, men still create techniques for deceit. I particularly loved the visual representation of noise on the page, and, in fact, wished for more. My favorite character is Manchee, the aforementioned talking dog, whose dialogue mostly consists of frequent, single-line barks of "Todd?" that provide some much-needed comic relief. Giving animals voice often personifies them too much, but Manchee's limited vocabulary, simplistic fixations, and one-word sentences phrased as questions feel very dog-like. Watching Todd's relationship with his dog develop is especially moving. From the first page he doesn't seem all that fond of Manchee's constant company, even telling us that he never wanted a dog, but when complications emerge and Todd finds himself in surreal, terrifying situations, Manchee not only stays by his side but frequently jumps to his master's rescue at his own peril. This loyalty isn't lost on Todd who gradually shifts into speaking of Manchee with the increased affection he deserves. Todd is not a hero, and I often struggled to like him. He makes mistakes in the book, and not little, justifiable mistakes, but ones that will force you to summon up all your understanding and empathy. At least he has clear virtues to balance his dark tendencies, unlike those who chase him, especially his archnemesis, Aaron, the brand of villain who not only borders on demented in his crazed obsession with pursing Todd, but the guy is near invincible! This is an amazing book, so I felt disappointed when the author resorted to one of my pet peeves: withholding crucial information from the reader. 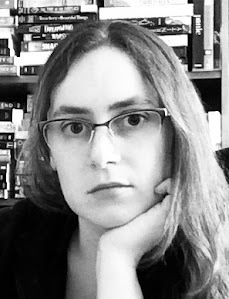 Writers can pull this off in many situations: when the protagonist doesn't know the secret either, for instance, or sometimes even when the character learned information pre-novel, but when this technique isn't used to my satisfaction, I feel cheated. In this case, Todd learns two things early in the book where we read the conversation only in terms of his shocked reaction, but don't learn what he found out, even though he continues referencing his mortification at this terrible secret that he doesn't share. Part of the issue with this strategy is that the longer the author keeps the reader waiting, the better the secret needs to be when it's finally disclosed. By the time the big reveal rolled around in THE KNIFE OF NEVER LETTING GO (of course, near the end), I had long ago guessed as much and thought the secret must be something else. The world setup also begs a potential logic issue: if everyone in Todd's town knew of this dark secret, why did he never hear a whisper of it in anyone's noise? Additionally, the book ends on a huge cliffhanger, which falls into this same category of withholding information for increased suspense, because the ending cuts off right in the middle of a climatic scene, no doubt to encourage readers to buy the next book. These disappointments were a shame, because the book doesn't need such tactics given how well the plot addresses strong emotions and creates intriguing hooks and dilemmas. 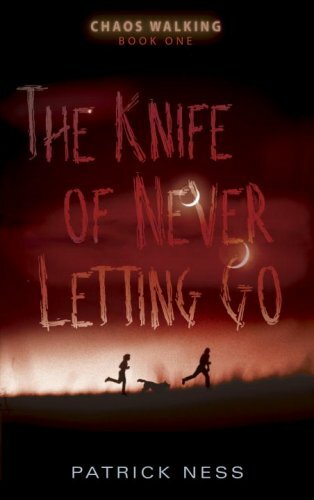 Even though cliffhangers and secrets detracted from the power of the story, I still really enjoyed THE KNIFE OF NEVER LETTING GO, and it should be said that those aspects are a minor part of the finished product. Handling emotions in improbable situations poses a big challenge, but Ness creates real characters, flawed and layered, and each dealing with trauma in their own way.